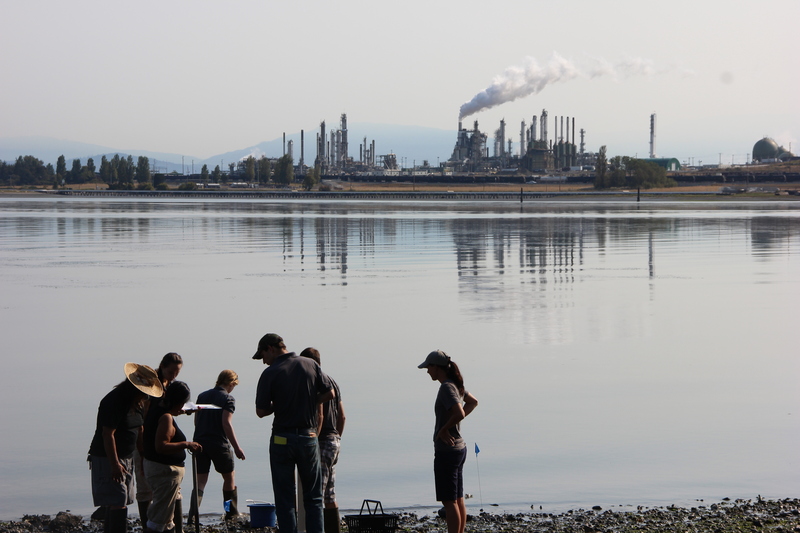 On August 20, 2014, Researchers from the Oregon State University (OSU) Superfund Research Program (SRP) have collaborated with two northwestern Tribes, the Swinomish and the Samish, to analyze environmental samples for contaminants. 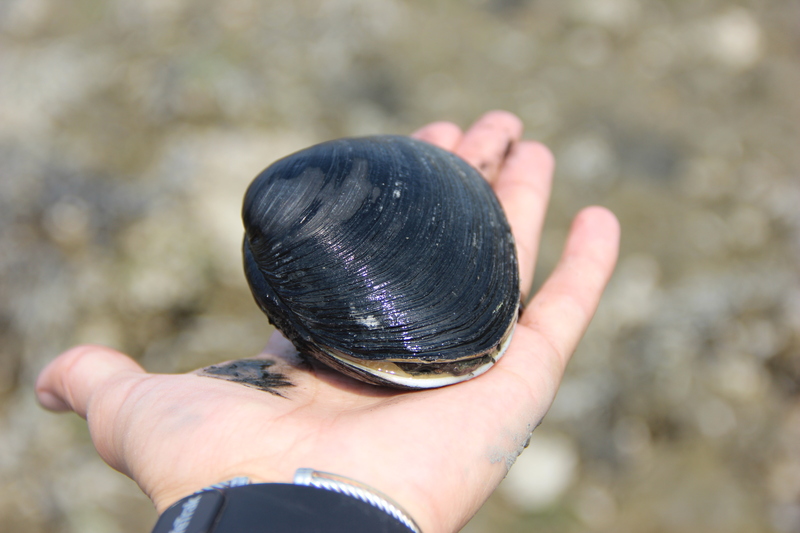 The team worked with Dr. Jamie Donatuto, the Environmental Health Analyst for the Swinomish Tribe, and Christine Woodward, the Director of the Department of Natural Resources for the Samish Tribe, to identify Tribal concerns regarding pollution of butter clams (Saxidomus gigantean). 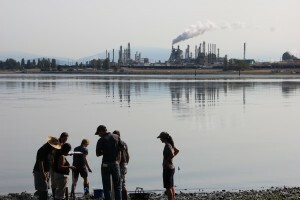 Shellfish beds in Fidalgo Bay are underused, given concerns regarding contamination from the two nearby oil refineries. The last sampling event in 2002 identified increased levels of toxics in butter clams at sites within Fidalgo Bay. (August 10-12, 2014) OSU SRP researchers meet with Bill Bailey (far left) and Rosie James (second from left, front) of the Samish Indian Tribe to collect butter clams and place passive pore-water samplers. 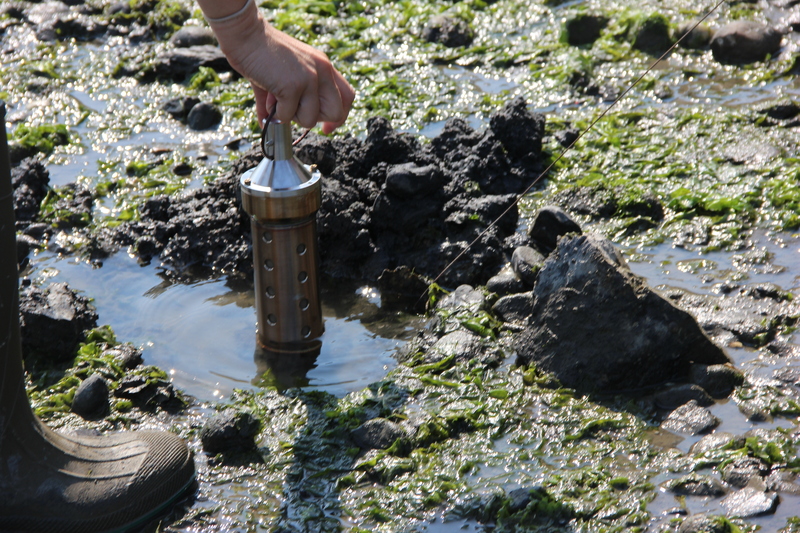 To continue this research, SRP visited four sites on Swinomish and Samish beaches within the Fidalgo and Similk Bay areas, collecting butter clams and deploying passive pore-water samplers in the sediment. In addition to identifying what contaminants may be present in the butter clams, the research team also aims to identify a new testing method to reduce the amount of resident shellfish that are collected when environmental sampling is needed. The goal is to predict clam contamination using passive pore-water samplers. If successful, this would enable researchers to determine shellfish contamination by putting out passive samplers instead of collecting clams. Using passive samplers is cheaper, faster, and less harmful to the local ecosystem than collecting resident organisms. This work aims to provide important information regarding risk from consumption of butter clams, new methods for monitoring baselines trends of contaminants, and may inform novel sampling methods useful to Tribes and Superfund researchers around the country. (Above) A butter clam (Saxidomus gigantea) collected by the research team. At each site researchers collected five clams. 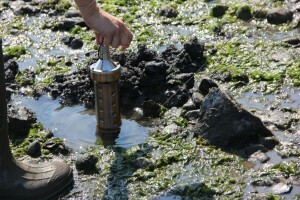 Where each clam was found, a passive pore-water sampler was placed (below). After four weeks, the samplers will be retrieved and analyzed. The chemical profile from the butter clam will be compared to the chemical profile of the passive sampler. This work was conducted under Material and Data Sharing Agreements with both the Swinomish and Samish Tribes. All data generated from this study belongs to the Tribes. The Tribes must approve any use of the data or samples. Posted in Community Engagement, Research.